Like I mentioned on Wednesday, I’m going to be taking a break from videos for awhile, and I’m going to merge the Weekly Three into Friday’s posts, but in a more casual way. I kind of just want to use Fridays to share my weekly outfits and all of the things I’m loving that week. This top I’m not so sure about. I like the idea of it, but the sleeves always fall down and it’s super annoying. Not sure if it’s worth hanging onto or not. These Vans were a mid capsule purchase. There are several pairs of shoes that I’ve been wanting to get, but I buy most of my shoes second hand so I wanted to wait until I could thrift them. These vans were found in a Goodwill and the boots below were found in a Savers. Score! This is mostly why I don’t subscribe to the no shopping between capsules notion. 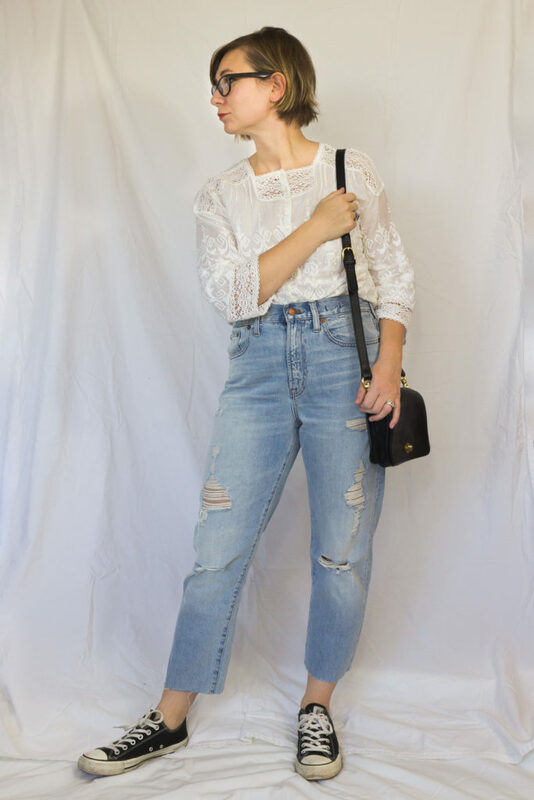 Most of my clothing is purchased through thrifting so I just have a running list on my phone of things I want to look for and if I find them… I get them. Easy! I love this top and these jeans, but honestly? I probably shouldn’t have included them in my fall capsule because I’m pretty much done with both of them. The weather just doesn’t allow for them. I felt a lot like a hipster in this outfit, which was nice because we sat next to a true hipster at church so I was able to catch his eye and be like “yeah, what’s up?”. Also, these are the other pair of shoes that I thrifted. 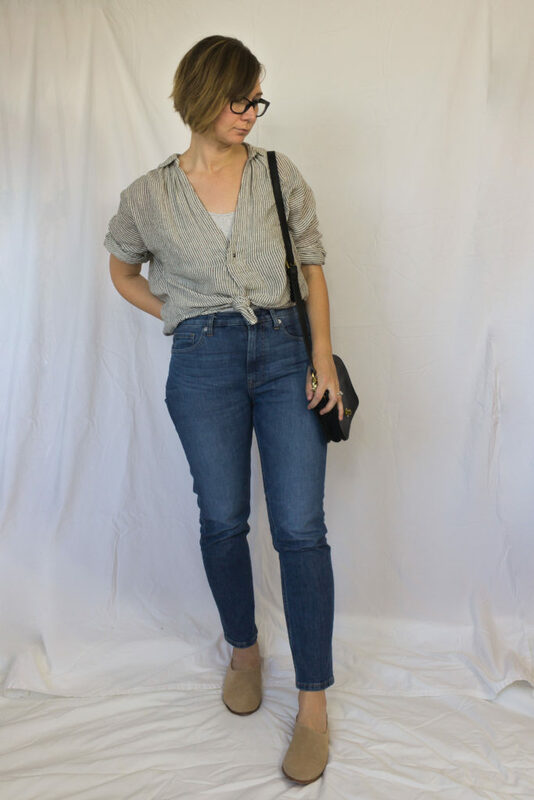 I pulled these jeans into my capsule because… they finally fit again! I haven’t been able to wear them since before Kit was born so that felt good! These pants were another item on “my list”. I was going to go for the Everlane option, but then these found me for about 1/3 the price at the Buffalo Exchange here in Minneapolis. Score! Rosie giving Ella lots of kisses and Ella giggling about it. these vegan hand poured soy candles from Washington. I have one in Apple Orchards and Pumpkin Cupcake and they smell divine! This serum. My skin is fully back to normal, which means adult acne galore. I don’t know exactly why this is working, but it is! Still loving this lipstick… I’ve worn it almost every day for an entire month. This food blog. She hasn’t updated it in awhile, but it’s worth a perusal through her archives. This post about sustainable menstrual hygiene products. It’s got me this close to trying a diva cup. I’m nervous, but I know it will be better for me. 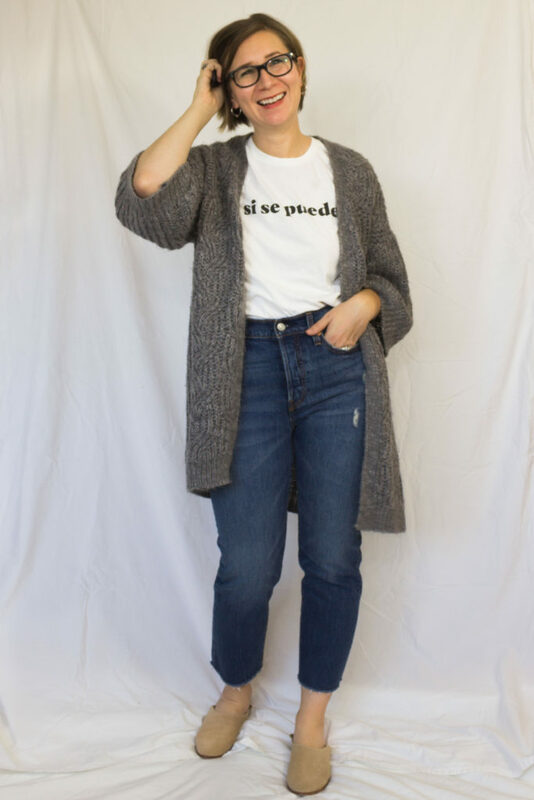 This post about ethical alternatives for the blazer trend. Listening to the Avett Brothers playlist on Pandora. MMM! So good! 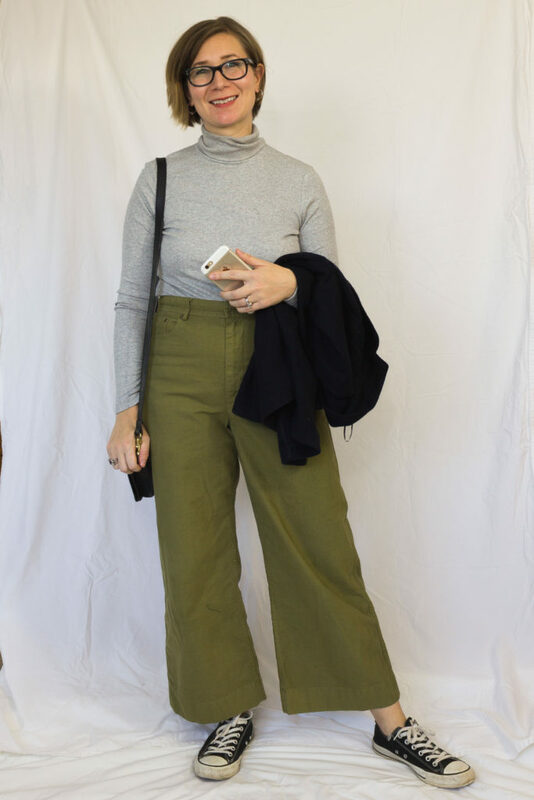 These pants from Girlfriend Collective look amazing! Cheaper than Lululemon and they’re fairtrade. Win! These tanks from Everlane. They’re not technically workout tops, but they’re perfect for yoga or pilates! These kits from Outdoor voices. You can choose a top and bottom and get a bundled price! So yeah! Those are all of the things I’m loving right now. What about you? I’d love to hear what you’re loving! Let me know in the comments below. And I hope you guys have a great weekend! My mom, Aunt, and Sister is in town because my sis is competing in a Kendama competition! Which I had no idea was a thing until she got into it… 🙂 What are you guys up to? Those candles are gorgeous! Love the wooden wicks, I’m a sucker for a great candle! The candles are so good! All great options for the fall. Love the variety! cute outfits, I loved Saturday and Wednesday! Love the variety you’re getting with the capsule wardrobe! Very cute. Karin, you have great style! I love this roundup of outfits. Your hipster commentary made me LOL. Let’s be hipster sisters. There are lots of hipsters around here, but most of them are like 10 years younger than me. I’d be lying if I said I didn’t try and channel some of their style. Your wide legs pants are awesome! I bet those are longer on you than the Everlane ones, which means you can probably wear them further into the season. 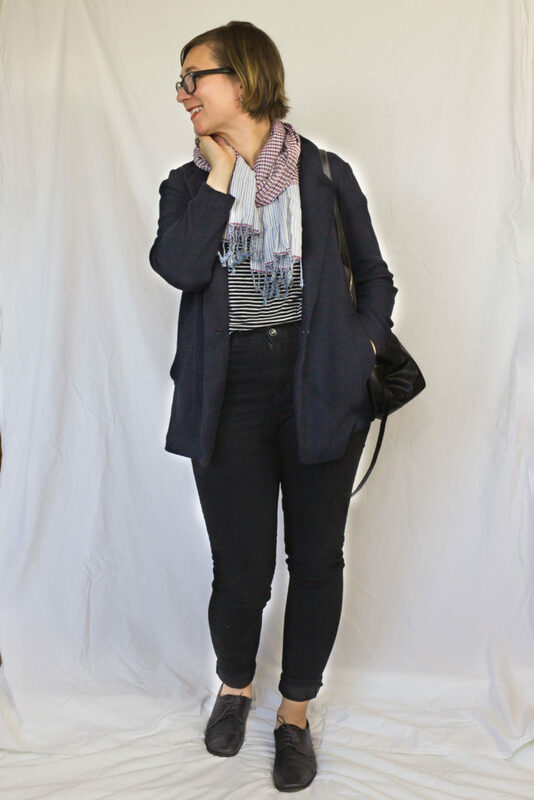 My Everlane ones can only we worn in warmish weather. As for the cup, you can do it!!! I’ve been a cup girl for 2 years next month – love it! Thanks Andrea! We’re for sure hipster sisters! Haha! I can imagine living in Portland that you’re a bit surrounded. There’s a pretty big hipster population here as well and I definitely look to them for inspiration! And yes! They are pretty long. I think they are going to work so well with booties once it gets super cold. Nice outfits! I think I like Friday and Sunday the best. Things I’m loving lately? Hmm…TV shows like The Good Doctor and Kevin (Probably Saves) the World would be on there. Thanks girl! I saw previews for Kevin saves the world and thought it looked cute! It’s a bummer that first top has annoying tendencies, it is SO CUTE. And good luck with the cup. I’m 2 months in, with 2 different sizes and it’s NOT GOING WELL. LOL. Hope you have a better experience! I know! 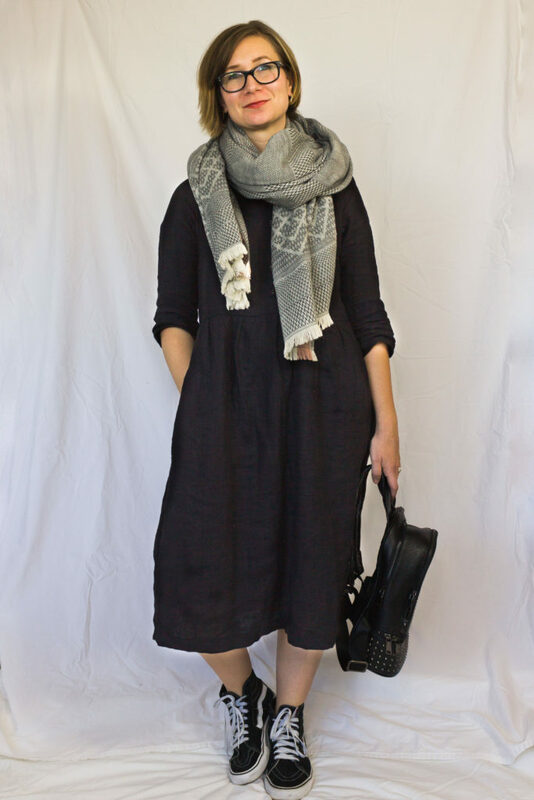 I’m thinking of maybe having my tailor cut the arms short and then just add it to my spring and summer capsules because I really love it too! And now I’m torn, because Andrea says its been going so well for her! I wonder if some people just aren’t built for them! Great looks! I love the olive green pants. I’ve been looking for something similar. Thanks! Thanks Paula! The green pants are so comfortable! I suggest the Everlane ones if you’re looking for a similar style! Daughter and her friends — all single, mid 20’s — all have diva cups. If I were of an age to need one, I’d use it, too. There was something similar available in the early 1980s (fuzzy on time) and it was great. I’ve heard good things! I’m just nervous about the price… if it really doesn’t work it would be a bummer to spend the $25! Great outfits, and thanks for the shoutout! I love those green wide leg pants. I live in Outdoor Voices crops tops and leggings for yoga, and they’re the most comfortable, most don’t-have-to-pull-or-adjust-anything workout clothes I’ve ever had. I also love Girlfriend leggings, but a little size warning: they’re tight! You’re welcome! That’s great to know about Outdoor Voices! I’ve been eying their workout gear for awhile, but I haven’t been in a place until now where buying workout clothes make sense. I think I’m going to start with one of their kits! Apa yang terjadi jika tidak menjumput laporan?